On 22 February JoAnn Benjamin, International Student Advisor at Northern Virginia Community College (NOVA), and I taped an interview with Ha Quyen, host of the popular Hanoi Television (HTV) program Study Abroad Window (Cửa Sổ Du Học). 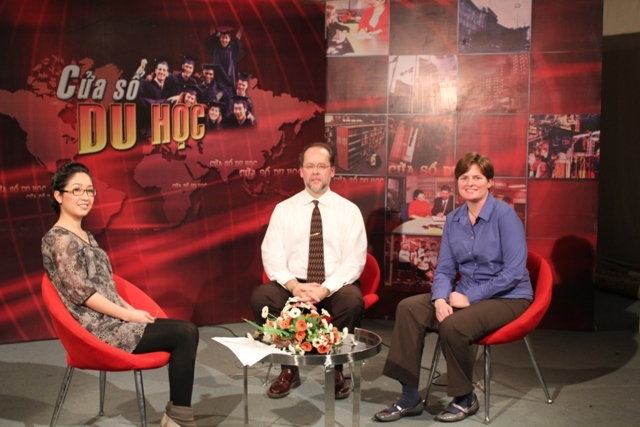 The program, which aired this morning on HTV at 8:10 a.m. and will be broadcast again on Monday, 14 March at 11 p.m. and on Wednesday, 16 March at 3 p.m., focuses on the popularity of community colleges among Vietnamese students, the advantages and benefits of attending this uniquely American form of higher education, how to select a schools (i.e., quality indicators), transfer opportunities to four-year schools to earn a bachelor’s degree, the visa application process, and advice for students/parents, among other issues. As I mentioned in a recent post, Vietnam ranks 2nd in international student enrollment at community colleges with over 8,000 young Vietnamese (6 in 10) beginning their StudyUSA experience at a two-year school in 2009/10. NOVA ranks among the top five F-1 and M-1 approved schools with 1,912 international students, including 250 from Vietnam.